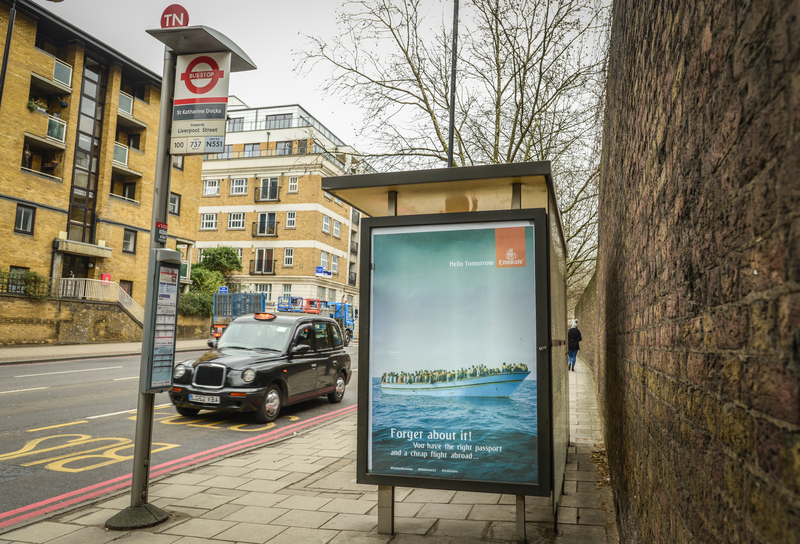 This weekend posters in support of the #Heathrow13 have mysteriously popped up in bus shelters across London. 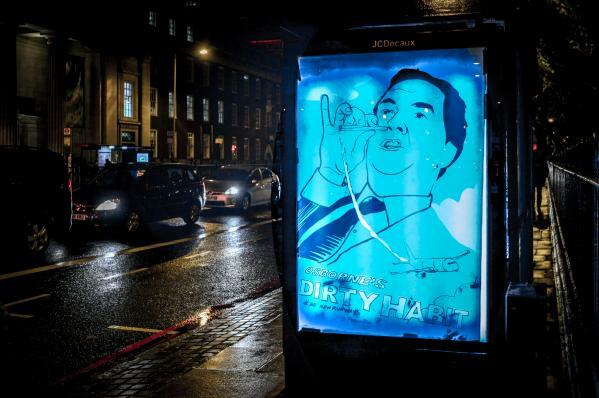 The artwork are made up of designs by campaigners, including Wretched of the Earth. 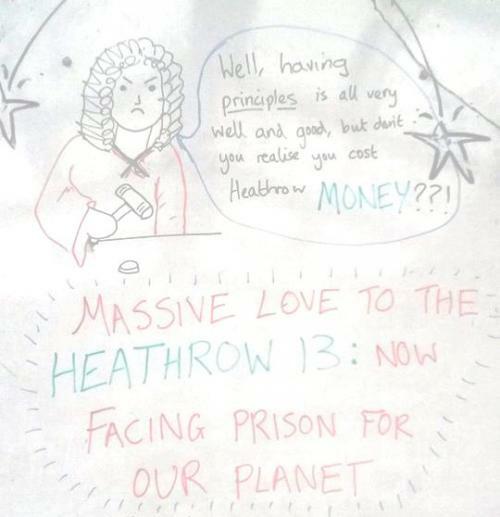 The posters criticise plans for airport expansion and advertise the upcoming court solidarity demonstration for the Heathrow 13 sentencing at Willesden Magistrates Court on Wednesday 24th at 9am. The 13 people were found guilty last month of aggravated trespass and being on a runway without permission after they closed the northern runway last July in opposition to airport expansion. Hundreds are expected to gather for the solidarity demonstration where the 13 have been told by district judge Deborah Wright “to expect an immediate custodial sentence”. One of the posters reads “Imperialist History Is Repeating Itself. 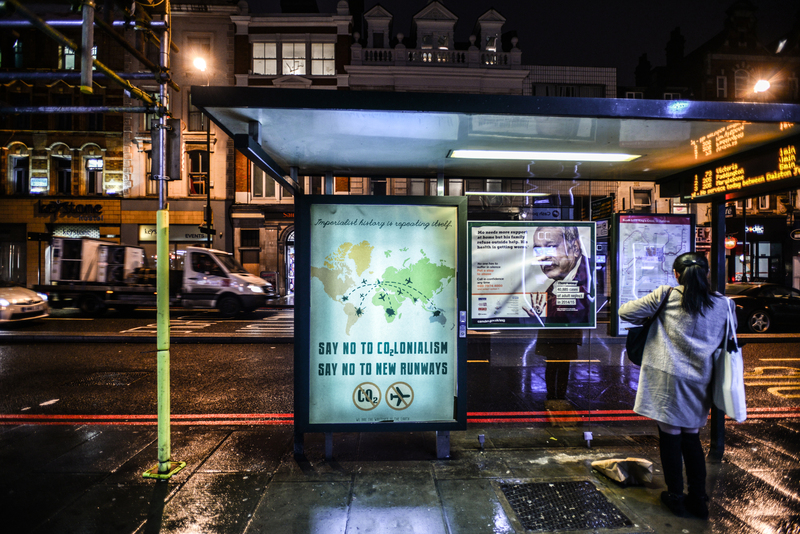 No to Co2lonialism, No to new runways”, whilst another focuses on the links between climate change and migration, emphasising the plight of climate refugees with a take on an ‘Emirates’ airlines advert with the logo altered to say ‘Emigrate’ with the hashtag #NoBorders. The artworks were placed in the cases without permission and although the identity of the mysterious poster installers is unknown, it shares many of the attributes of the anti-advertising art group Brandalism, "a revolt against corporate control of the visual realm". Since 2012 there have been take overs of advertising in public spaces in over ten UK cities as well as in Paris during the climate talks last year, where hundreds of posters mysteriously appeared. See if you can spot one of the posters around town before the authorities find them and take them down. But in case you miss them, here are a few that we've seen. 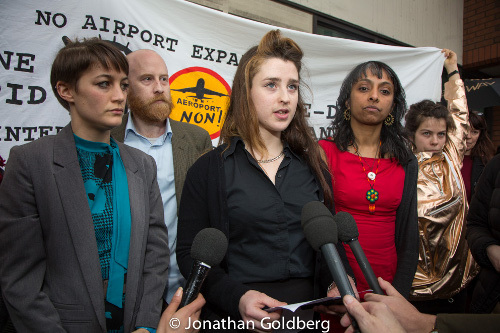 The #Heathrow13 will return to court for final sentencing, having all been found guilty of aggravated trespass and entering the security restricted area of London Heathrow Airport’s north runway. All 13 have been told by District Judge Deborah Wright that they "should all come expecting custodial sentences”. 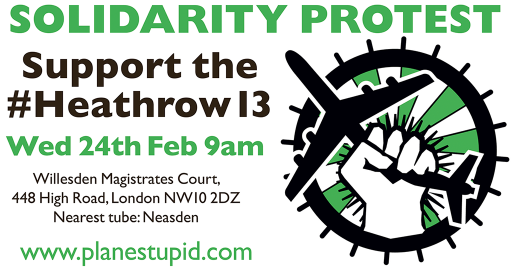 Please come and join us outside the court at 9am sharp, together with Heathrow residents and others, to say that climate justice is the only appropriate form of justice here, and that we need to Stop Aviation Expansion & Stop Co2lonialism! 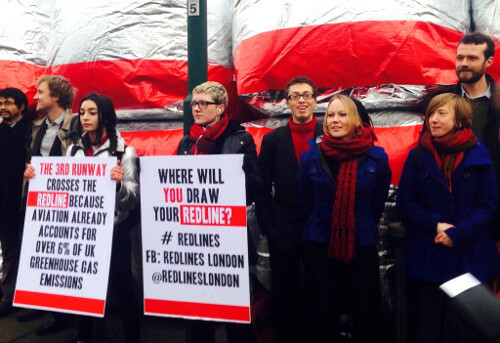 Wear red clothing to show that that prison time for protecting the climate is a #Redline. Sentencing is expected to take 1 to 2 hours. For the latest info see the Facebook event. No one will be allowed to stand in the public gallery - only to occupy the 26 seats which will be ticketed, following a letter from the court. These tickets will mostly go to family of the defendants. After the judge told the defendants to prepare for prison, people in the public gallery had shouted out, "shame on you", "this is a farce" and "history will judge". The letter says the new restriction is due to "a potential risk to health and safety". The court has also said "access to the concourse of Willesden Magistrates Court will not be permitted to anyone not in possession of a ticket [except] press" because "on the last occasion there was a great deal of noise". There had been clapping and cheering after the defendants left the courtroom. Speakers will include MPs, residents who would lose their homes to new runways, environmental activists and voices working with communities on the front line of climate change, floods and drought. Why not print off a picture of David Cameron's face and tie some elastic to it for a mask? After all, he opposes new runways at Heathrow, 'no ifs, no buts'. Separately, the trial for the three activists who blockaded Heathrow's road entrance tunnel will be on Tue 19th and Wed 20th April at Willesden Magistrates Court. Start time is 10am - arrive by 9.30 for a bag check. They pleaded not guilty to a charge of breaching a specific Heathrow Airport byelaw: obstructing a tunnel/tunnel access road at Heathrow Airport. This carries a maximum sentence of a fine. Most of the defence’s witness evidence was not heard in court, and none of the witnesses were allowed to appear in court. John McDonnell was not heard in full due to the Judge having already accepted the points he was addressing, and therefore ruling the statement irrelevant. Statements from three local residents from the Heathrow area were read out, detailing the debilitating and life-threatening medical conditions they were suffering from as a consequence of living near to the airport. Character references for the defendants were also read out in court, from a variety of public figures including High Court Judge Peter Jackson and a long list of barristers and solicitors. In all, of the ten defence witnesses, only four had their evidence allowed, and none were permitted to appear in court. 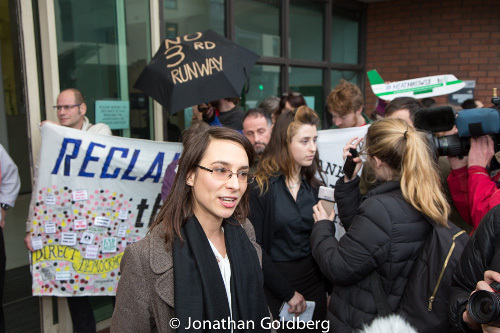 The runway occupation, under the banner of anti-aviation expansion group Plane Stupid and the first on a Heathrow runway, lasted six hours and delayed or cancelled dozens of flights. The activists, who are all pleading not guilty, are accused of aggravated trespass and trespassing airside without authority. The defendants are Sheila Menon, 43, of Hackney, east London, Rebecca Holly Sanderson, 27, of Machynlleth, Powys; Richard Steven Hawkins, 32, and Kara Lauren Moses, 31, both of Heol y Doll, Machynlleth; Ella Gilbert, 23, of Finsbury Park, north London; Melanie Strickland, 32, of Waltham Forest, north-east London; Danielle Louise Paffard, 28, of Peckham, south-east London; Graham Edward James Thompson, 42, of Hackney, north-east London; Cameron Joseph Kaye, 23, Edward Thacker, 26, Alistair Craig Tamlit, 27, and Sam Sender, 23, all of West Drayton, west London; and Robert Anthony Basto, 67, of Reigate, Surrey. The defendants have all pleaded not guilty and argue that their action was necessary due to the airport's contribution to life-threatening climatic changes. Furthermore, Heathrow expansion is inhumane to the local residents and those at the sharp end of climate change, and hugely environmentally destructive. The fact that it’s still being considered at all is a testament to the superiority of corporate lobbying over democracy and scientific evidence. The defendants are represented by barristers instructed by Mike Schwarz of Bindmans, and Raj Chada of Hodge Jones and Allen. Defence witnesses (if not deemed inadmissible by the court) will include politicians, scientists, local residents and prominent authors. 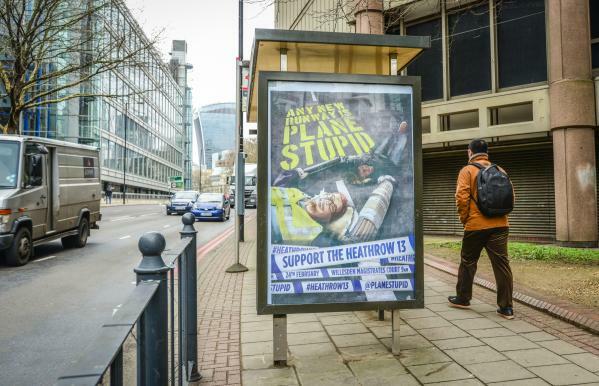 Heathrow’s third runway has been the biggest iconic battleground for both climate change activism and local resistance to imposed national infrastructure. The issue has become such a political hot potato it has been kicked down the road by every government for decades. After years of scare stories from the press that climate activists were planning to occupy the runways at Heathrow, in July 2015 it finally happened. There was international coverage in 2007 of Climate Camp pitching up on Heathrow’s doorstep for a week, and ten years of continuous pressure from Plane Stupid, Greenpeace and other groups, who occupied various runways but never Heathrow. But last July, David Cameron’s grinding slow-motion U-turn on the issue drove thirteen activists to occupy and close the north runway at Heathrow at 4.00am on July 13th, 2015, for the first time. Some of the activists were new to aviation protests, some were more experienced activists, like 67y/o atmospheric physicist Rob, and 23y/o climate science graduate Ella. Some are residents of Sipson who have and continue to campaign against the third runway in a variety of ways, like 23y/o Cameron and 26y/o Eddy, some from London, like 32y/o Melanie who works for a health charity, and the first Plane Stupid activist to ever be arrested in 2005, 42y/o Graham, others from further afield, including three from Wales. Most of the activists have no previous convictions. They are all facing up to three months in prison. The occupation took the form of a sophisticated ‘lock-on’, with the legs of a tripod of scaffolding poles piercing a triangular cage of Heras fencing, with one or two activists locked to every corner, and everything connected to everything else, to make the whole structure as immovable as possible. It took the specialist police extraction squad over six hours to remove them from the runway, during which time many flights had to be cancelled. The reason Heathrow is such a unique, iconic battleground in national politics is that it has come to represent the big test of a government’s seriousness about climate change. Dirty energy infrastructure can be replaced with clean, local issues can be resolved by relocation, but aviation is always extremely dirty, with no clean tech version in production. Local residents oppose Heathrow and Gatwick, as well as other airports around the country which had expansion plans before the problems of aviation expansion became well known. And they are campaigning not for the new runway to be somewhere else, but for there to be no new runways. The third runway is all-or-nothing, there is no room for compromise. The environmental progress made globally, in Europe, and in the UK prior to 2010, has left a legislative trail. Heathrow’s air quality is the worst outside central London, with NOx and other pollutants well above the legal maxima (and London breached its EU air pollution limits for the whole year in just eight days). And the 2008 Climate Change Act includes legally binding emissions targets which ‘business as usual’ expansion of aviation would wreck. Heathrow’s current operations are illegally polluting, and a new runway is not going to improve things. The intensity of the opposition to Heathrow, which encompasses MPs, cabinet ministers and all the London mayoral candidates from all parties, as well as the current London Mayor, the local councils, residents’ groups, green NGOs and direct activists like Plane Stupid, finally stopped what had only a few years earlier been seen as an entirely inevitable development in 2010. David Cameron, between hugging huskies and declaring his government the greenest ever, made the now infamous election pledge ‘no ifs, no buts, no third runway’, and many west Londoners voted for that pledge. That huge coalition of opposition is ready to come back together to oppose a new runway in the courts, at the ballot box, and on the ground. Now his supposed opposition to the third runway is the last flaky patch of greenwash still adhering to the tory brand. As foreign leaders and UN officials voice their confusion at Cameron’s government trying to shut down the clean tech sector and prop up the industries of the last century, as Britain sweeps up the debris from the climate impacts already hitting us, and as the entire world from the US to China, agrees to a more urgent climate stabilisation programme, Heathrow is the last memory of Cameron’s ‘modernisation’ programme for his party. The government continues to promise to deal with climate change, most recently at the COP in Paris and in wellies in Cumbria, whilst continuing to make it worse and hope no-one puts two and two together. The thirteen activists, all facing possible prison sentences, have watched the continuous parade of lies and broken promises from Heathrow and successive governments, and realised that no amount of scientific evidence will be enough to make them stay within the law or safe emission limits, and citizens need to stand up against the lobbying power of major industries before it’s too late. When the Prime Minister is set to break a ‘no ifs, no buts’ pre-election and manifesto pledge, civil disobedience is needed to uphold democracy. The runway occupation is what democracy looks like.